Leptin is the Master Fat Hormone, and it works by signaling the hypothalamus of the brain. The questions for fat loss now under study are starting to look at how leptin and HCG interact. The idea is that they may be using the same or similar brain receptors. It is a great topic for understanding more about how HCG works. Here is a great article that goes down the road of explaining leptin metabolism. Let me know if you have any questions, class! Here are some extracts from a highly informative article on leptin, a hormone secreted by fat cells that influences energy expenditure and food intake. Dr. Simeons commented that low thyroid does not cause of obesity. In fact, he recommended that thyroid meds NOT be taken while doing the protocol. Furthermore, a low Basal Metabolic Rate (i.e., indicated by lower body temperature first thing in the morning) gets reversed on the HCG diet. Research generally supports these points now. Here is a link to Amazon for this book. You can find more information about it there. Dr. Brownsteins’s book explains how Americans have become iodine deficient and what to do about it. The key regarding the HCG weight loss diet is that iodine restores thyroid health whereas iodine drugs do not. You will also find that thyroid meds slow down weight loss on the HCG diet. It is all tied in with the hypothalamus and the hormone receptors there for HCG and thyroid hormone. Nobody has a really good explanation for this. One more thing that I can say, from my perspective as a biochemist, is that the best that thyroid meds can do is provide iodine. The hormones themselves, as well as the synthetic versions of them, contain iodine. The chemical structure of thyroxine, for example, shows four iodine atoms (each place where there is an “I” in this picture). It makes sense that iodine deficiency shows up as low thyroid hormone. The body won’t make enough hormone if there isn’t enough iodine in the first place. The bottom line for most people is simply going to be supplementing with iodine. By the way, the RDA of iodine (150 micrograms) is about one-tenth what it should be. And most people don’t even take in the RDA. Food does not offer it, unless it is seafood. And then it is only ionic iodine. Dr. Brownstein explains the importance of getting different forms of iodine and how to optimize the dosages for maximum thyroid health. SIDENOTE: In reading about Dr. Brownstein’s research, I was also flabbergasted to see the role of iodine deficiency in breast cancer and prostate cancer. Actually, I am still flabbergasted about this! Dr. Simeons was right on target about the role of the thyroid, or rather the lack of it, in obesity. Nevertheless, it is critical to get this gland functioning correctly for getting the best results for fat loss on the HCG diet. HCG diets are not exactly new, but they are becoming more and more popular as they people continue to report success stories of weight loss from following the diets. HCG sales have taken off online as well in doctor’s offices across the world. More and more people are getting interested in actually losing their weight and they are turning toward HCG diets. 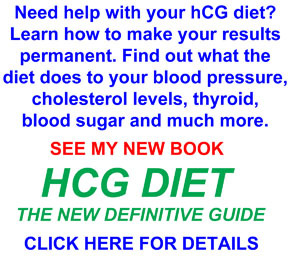 What is HCG?HCG is an acronym for Human Chorionic Gonadotropin, which is a natural chemical that is made in humans. Both men and women have HCG in their tissues, but it is most prevelent in pregnant woman. It is the hormone that causes a woman to register pregnant on pregnancy tests as it is found in the urine. People are born with HCG in their body and it helps to develop the reproductive organs, but is also works with the hypothalamus to help regulate a person’s body fat. Why HCG Diets For Weight Loss?A British endocrinologist named Dr. Simeons came up with a low calorie HCG diet that he found to be effective for weight loss and controlling obesity in people. While studying pregnant women and overweight boys in India that were being treated with a low dose of HCG for pituitary problems, he noticed that they were losing fat, not muscle, on the diet. He came up with the medical conclusion that the low doses of the hormone were enough to help the hypothalamus regulate the burning of stored fat cells in the body. He came up with a 500 calorie diet that goes along with regular doses of HCG that significantly showed great results for weight loss when followed properly. The way that HCG diets work is that the low dose of the hormone stimulates the body to burn the stored fat cells that are hard to get rid of with exercise and healthy eating. Normally, without HCG supplements, the body will use the food that was just eaten for energy for the body. When HCG is taken, it used the stored fat first, making it possible to lose weight rather quickly. Dr. Simeons study showed that people could easily lose one to two pounds in a day on HCG diets. Just like any other diet, before starting a HCG diet talk to your physician about your weight loss. If you really want to learn more about HCG diets, find doctors in your area that approve and endorse these types of diets. Then you can have all the information that you need to buy your HCG supplements and start your journey of losing weight with HCG diets.